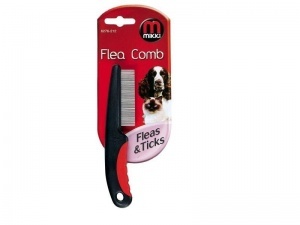 Flea comb from Mikki to help keep your dog flea-free! Thoroughly comb the coat with a Mikki comb or brush. Have a large sheet of paper underneath your pet so that the fleas & eggs can be easy seen and destroyed. Light paper will allow dark eggs to show up.